A VERY FINE FRENCH & INDIAN/REVOLUTIONARY WAR PERIOD REGULATION (P. 1757) HEAVY DRAGOON BASKETHILT BACK SWORD, ca. 1760: In overall very fine untouched condition. The 36 1/4″, unmarked, blade cut with a full length fuller and is double edged for 2/3 its length. 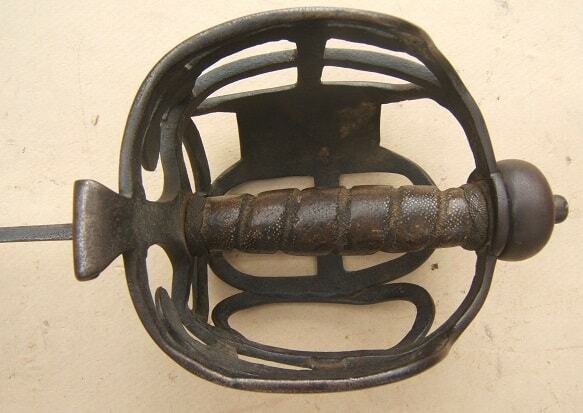 The basket-type hilt formed of large forge-welded bars which incorporate an opening for reins at the rear. Small scroll-shaped quillon and a plan lobed pommel. 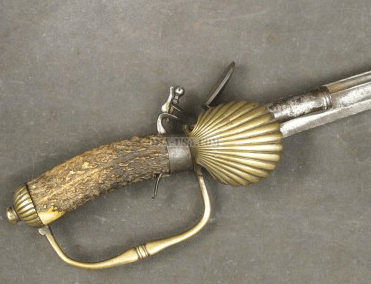 The grip is fitted with its original spirally-fluted, rayskin cover, secured by a braided wire Turk’s head. In overall very fine untouched condition. The blade with smooth surfaces without pitting and retaining an untouched age patina. Matching surfaces to the basket-hilt. Original grip with choice surfaces to the leather wrap: missing the wire binding. 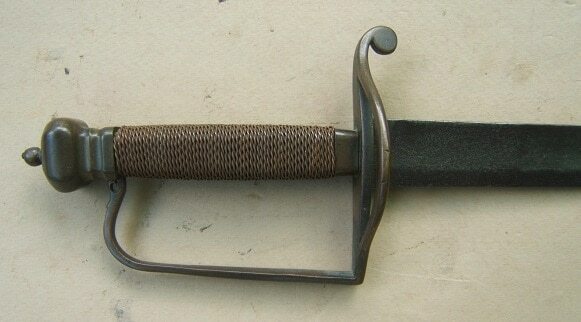 A rare Regulation English Heavy Dragoon Backsword dating to the French & Indian/Revoltionary War, ca. 1760. For similar examples, please see G. Neumann’s: “Battle Weapons of the American Revolution”.